Praise Teams are open to youth and adults with vocal or instrumental experience. They lead worship for the 5pm Saturday and 9:30am Sunday services. They provide music for other events in and outside of the church. Membership is by audition and on an as-needed basis. Rehearsals for the 5pm band are Saturdays, 3-4pm. 9:30am band rehearsals are Sundays, 6:30-7:30am. For more information, contact Sean Edins. The Brass Ensemble is open to all youth and adults who are experienced brass instrument players. The Brass Ensemble plays frequently at 8:15 and 11am worship services and for special presentations. Rehearsals are Thursdays, 7-8pm, in the Music Suite. For more information, contact Carl Lorey. Open to all youth and adults, this handbell ensemble plays for 8:15 and 11am worship throughout the year. Membership is by permission of the Director of Music and Worship Arts and positions are filled on an as-needed basis. Rehearsals are Thursdays, 7-8pm, in the Sanctuary. For more information, contact Carl Lorey. The Chancel Choir is open to all youth and adults who love to sing and lead worship. This ensemble leads the music in 11am worship most Sundays throughout the year and in 8:15am worship on the first Sunday of every month. Both traditional and contemporary choral literature are presented weekly as well as major works with orchestra seasonally. Rehearsals are Wednesdays, 7-8:30pm, in the Music Suite. For more information, contact Carl Lorey. The children’s choir sings in worship services during the year and is open to all children in Kindergarten-6th grade. These choirs sing music that is age appropriate as well as presenting a children’s Christmas musical in December. Rehearsals are Wednesdays, 6:15-7pm, in FLC 204 and 206. Contact Carolyn Swann for details. This ensemble provides visual enhancement to worship, performing during select services throughout the year. Membership is by audition on an as-needed basis. Rehearsals are determined by members’ schedules. For more information, contact Carl Lorey or Meagan Maison. 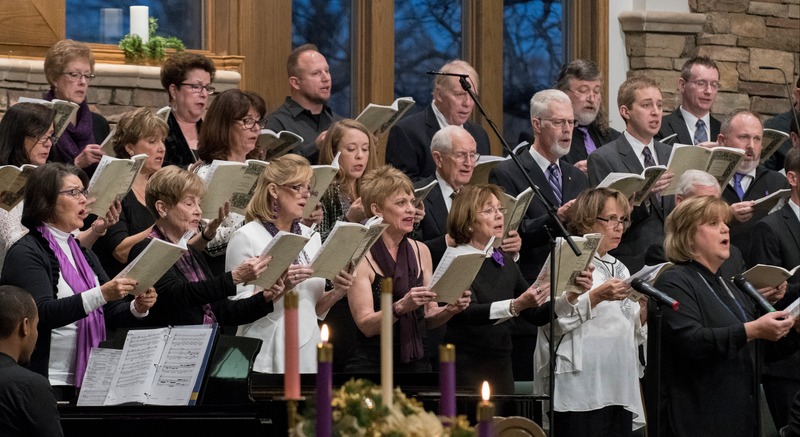 The Methodist Men's Choir and Grace Notes Women’s Choir are meant to be an outlet for adults in the church who would like to be involved in choir but are unable to commit the time to sing every Sunday. These groups provide music for 8:15 and 11am worship about 2-3 times throughout the year and rehearse on the Wednesday before they sing in worship. For more information, contact Carl Lorey. This ministry provides a Summer theater experience each year where the participants, entering second grade through college freshman, an opportunity to immerse themselves in a real, live musical production. Components include singing, dancing, acting, stage crew and set creation. For more information, contact Carl Lorey. Register for the cast and crew of Alice in Wonderland, Jr. The audio, video and livestream engineers are responsible for framing the sensory elements of worship in a way that it can be clearly and comfortably experienced. Members are cross-trained in all three areas in case a need arises for additional support or coverage. For more information, contact Sean Edins. Youth Choir is open to all students 7th-12th grades. They sing frequently in worship services. Rehearsals begin Sunday, February 24, 12:15-1:15pm in the Music Suite. You may bring a sack lunch or plan to eat before or after rehearsal. Contact Carl Lorey for more information! Youth Praise Band is a group of young people (7th-12th grades) and adult leaders who wish bring worship to life through song. The group rehearses Sundays, at 3:45pm in DAC 404 (the YAC) as needed. Youth Praise Band also leads worship on Sunday evenings for Collide. In addition, our group participates in a variety of other worship services throughout the year. If you play an instrument, love to sing or would like to work behind the scenes, contact Abigail Herrington for more information! If you sing or play an instrument and are looking for ways to use your gifts and abilities, please contact Carl Lorey.